I got my preorder for Stampin' Up! 's Holiday catalog and just had to play with the new products. You can order from this catalog starting August 1. This card uses the Scentsational Season stamp set and coordinating Holiday Collection Framelits. You can buy the Scentsational Season stamp set and coordinating Holiday Collection Framelits for 15% off by buying the two of them as a bundle. More details are in the Stampin' Supply list below. Using the Wonderfall stamp set and coordinating Autumn Accents Bigz Die was fun. 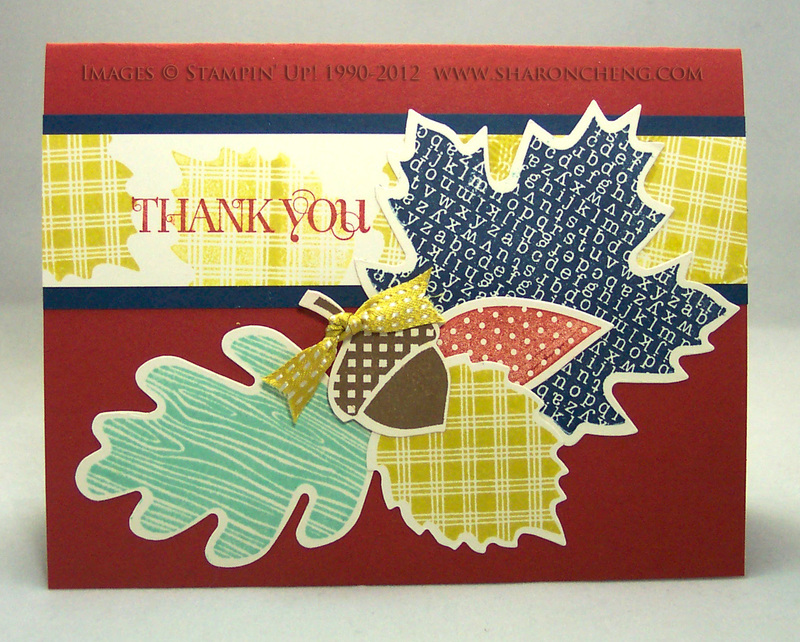 I love fall and design at least one card with fall leaves every year. 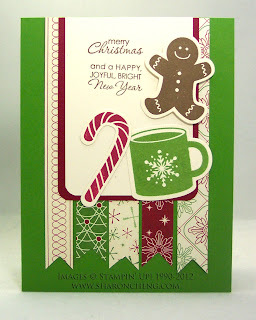 Both cards have bold images and I was thankful to have Stampin' Up! 's new firm foam stamp sets. One item on this card was stamped using an ink pad with the original felt pad. Can you tell which one? Leave a comment on this post with your guess by July 13th. I'll draw names from the correct guesses and the winner gets a $5 gift certificate! Find out why I'm converting all of my ink pads to the new firm foam design and how to earn a free ink pad in July. *Remember that you can order the items from the Holiday catalog on August 1. I've starred those items on the supply list. Very nice cards. I esp like the Christmas Card. Nice job....great colors...those new ink pads must work very well. My guess is the red leaf. Not quite as bright. Great cards as usual. Can't wait to get my new things. I guess the polka dot leaf. Congratulations! Since both of you guessed correctly, I'd like to give each of you a $5 gift certificate. Please pm me at sharon@sharoncheng.com to get your gift.